With so many people giving beauty advice and tutorials these days, it's easy for makeup myths to spread. Keep reading to see if you're guilty of doing these makeup faux pas! Myth #1: Pumping your mascara wand will get more product. Myth #2: You should only get rid of mascara once it dries out. Mascaras quickly expire and go bad after two to three months. It's important to constantly replace them to avoid germs from getting into your eyes. 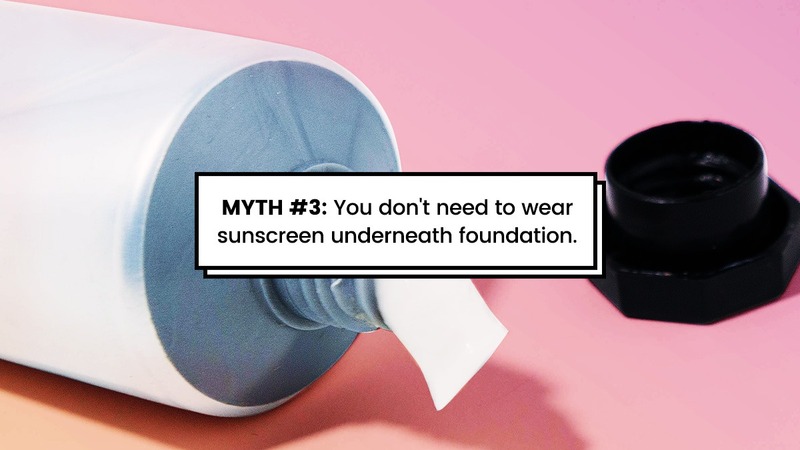 Myth #3: You don't need to wear sunscreen underneath foundation. The SPF in foundations, BB/CC creams, and tinted moisturizers are not enough to protect your face from the sun. According to Reader's Digest, if you're going outside for more than 10 minutes, you're going need real sunscreen underneath your makeup. Look at the bright side: It works great as a base. Myth #4: You should match your foundation to your wrist or hand. Due to sun exposure and weather conditions, the skin on your wrist and hand have different colors than your face. To get the perfect foundation match, apply the product on your jawline or cheeks and check it in natural light. Myth #5: You should use a concealer that matches your foundation. If you've got insane eye bags, using a concealer that matches your foundation won't hide it. Cosmopolitan US recommends using something with a ~*peach undertone*~ to cancel out the darkness and brighten the area. Myth #6: You're not "allowed" to wear smoky eyes with a dark lip. We've all heard statements like this before. But it's 2018, ladies and gentlemen! Whatever makeup look you feel comfortable and confident in, go for it and flaunt it like a boss. Myth #7: You don't need to clean your tools because you're the only one who uses them. Your makeup tools don't just come into contact with your face, they touch your makeup bag and vanity, too. And both areas have germs and bacteria that can be transferred to your tools and then your skin. Wash them at least once a week to avoid irritations and new pimples!